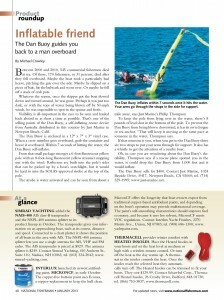 The January 2013 issue of National Fisherman includes a review of the self–inflating man overboard dan buoy by Michael Crowley. He notes that between 2000 and 2010, 170 of 540 commercial fishing fatalities (31%) resulted from falling overboard. In cold water, minimizing minutes overboard is critical. Click the image to read his report. This entry was posted in Safety at Sea and tagged reviews by Test. Bookmark the permalink.